The big story from Sunday’s municipal elections in France is the success of Marine Le Pen’s far-right Front national (FN, National Front), overshadowing the marquee Paris mayoral election. The far-right won the mayoral race in Hénin-Beaumont, a former mining town in the north, in a rare first-round victory, the FN came in second in Marseille, France’s second-largest city, and it led in at least six other locations as France prepares for second-round runoffs on March 30. The result should certainly boost Le Pen in her efforts to win support in European parliamentary elections in May — and to unite the populist hard right across the continent. According to preliminary results, the Front national won just 4.65% of the national vote. That’s a big deal because the party was running in just 597 of around 37,000 jurisdictions — it’s a massive increase from the 2008 municipal results, when the FN won around 1% and ran in just 119 constituencies. The other narrative from Sunday’s vote is the collapse of France’s center-left — president François Hollande’s Parti socialiste (PS, Socialist Party) won 37.74% nationally, while the center-right Union pour un mouvement populaire (UMP, Union for a popular movement) of former president Nicolas Sarkozy won 46.54% nationally. The bright spot for the Socialists remains Paris, where first deputy mayor Anne Hidalgo is the slight favorite to win a runoff against former Sarkozy campaign spokesperson and ecology minister Nathalie Kosciusko-Morizet — but don’t rule out an upset next Sunday there, either. The success in the 2014 municipal elections is just the latest chapter for Le Pen’s rebranding of the Front national in France as a slightly more moderate alternative than the party her father, Jean-Marie Le Pen, led for decades. It’s harder today to target the Front national as a xenophobic, anti-Semitic fringe, because Le Pen has focused on an agenda much heavier on euroskepticism and economic nationalism. While the Front national isn’t exactly immigrant-friendly, its position has largely converged with the UMP’s position since the Sarkozy presidency, which embraced hard-right positions on immigration and law-and-order issues. By shifting rightward, Sarkozy may have sidelined Le Pen during his presidency and co-opted her supporters, but today, Sarkozy is almost as responsible as Le Pen for bringing the Front national within the political mainstream. With the line blurring between the UMP and the Front national, Le Pen could become the chief voice of the French right in 2017, especially if the UMP succumbs to more infighting between its right-wing leader Jean-François Copé and the more moderate former prime minister François Fillon. The next presidential election is still a long way off, but if Sarkozy doesn’t run for the presidency in 2017, Le Pen stands just as much chance as Copé, Fillon or any other UMP figure of representing the French right in the second round. More immediately troubling for France’s political elite are the European parliamentary elections in May. Despite its breakthrough performance on Sunday, the Front national isn’t about to overrun the city halls of France. 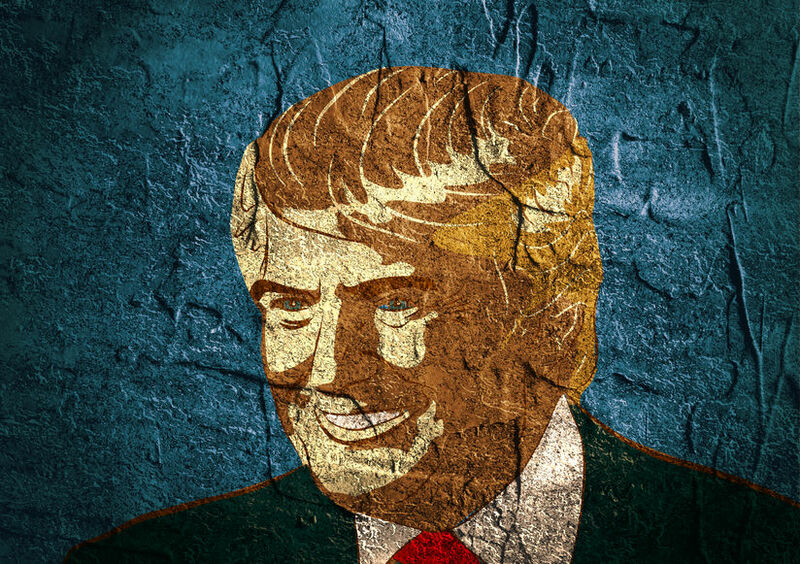 Its victory is more symbolic than substantive. But if it’s one thing to turn over your local government to Marine Le Pen, it’s a far different thing to support the Front national as a protest vote with respect to European Union policy. Polls show that the Front national and the UMP are competing for first place in the European elections within France — the most recent Opinion Way poll from early March shows the UMP winning 22%, the FN winning 21% and the Socialists just 17%. It wouldn’t be surprising to see a wave of undecided voters support the Front national at the last moment, nor would it be a surprise to learn that polling surveys currently underestimate FN support. 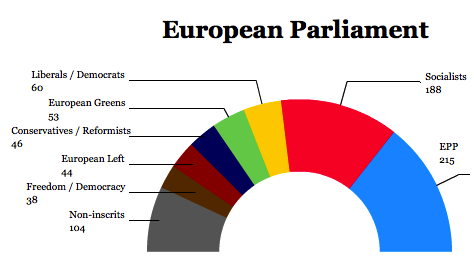 Extremists on both the far left and the far right are gaining strength throughout the entire European Union. That’s perhaps understandable, given the harsh economic conditions that have plagued Europe since the last EU-wide elections in 2009. But the euroskeptic right, in particular, seems poised for a breakthrough. Nigel Farage hopes to lead the anti-EU United Kingdom Independence Party to a breakthrough performance in May, and the Freiheitliche Partei Österreichs (FPÖ, the Freedom Party of Austria) is tied for first place in polls in Austria. 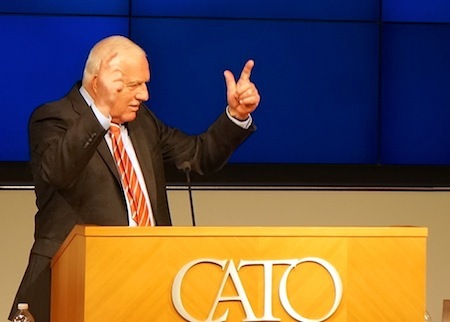 Just three days after leaving the Czech presidency, Václav Klaus spoke at the Cato Institute in Washington earlier today — Klaus is joining Cato as a senior distinguished fellow this spring. Klaus, who stepped down after a decade in office, didn’t break much new ground — his remarks were essentially everything you’d expect from the famously euroskpetic former president, who was the last European Union head of state to sign the Treaty of Lisbon (and quite reluctantly, at that). In brief, Klaus has long argued that the eurozone is not an optimal currency zone, it’s a project that was implemented without sufficient democratic input from everyday Europeans, and the economic costs of monetary integration and centralization far outweigh the benefits, and those costs have become increasingly evident from the economic pain suffered today in Greece, Spain, Italy and throughout Europe. Klaus’s diagnosis has become fairly uncontroversial — both on the left and the right, and for both intergovernmentalists and neo-functionalists alike. A lot of European federalists would agree that the European Union needs more robust democratic institutions at the supranational level. Many economists agree that the one-size-fits-all monetary policy has been incredibly harmful to many countries in southern Europe since 2008, and the painful internal devaluation forced upon many countries in the European periphery, from Latvia to Greece, has been a needless exercise in poor economic policymaking. But whereas many economists would argue that the solution lies in greater fiscal harmony (especially through fiscal transfers from wealthier regions to poorer regions), looser monetary policy, a eurozone-wide borrowing capacity, debt forgiveness and a doubling-down on the more long-standing commitment to the free movement of goods, services and people throughout the European Union, Klaus’s solution is to unwind the eurozone. Klaus would rather see a way for Greece — and other troubled economies — to simply exit from a eurozone that’s delivered now nearly half a decade of GDP contraction, painful downward pressure on income, and widespread unemployment and social rupture. That’s not a crazy idea economically — if Greece could leave the eurozone tomorrow (or if Greece simply went bankrupt, thereby essentially forcing Greece out of the eurozone), it could conceivably pursue a much more aggressive monetary policy, devalue its currency, and take other steps to make its exports more competitive in global markets once it’s no longer yoked to a monetary policy that’s better suited for, say, the German economy. But that’s not the entire story. Greece might also suffer extraordinarily in the short-run while it makes that transition — starting with how it would reintroduce the drachma and how it would even finance basic governance outside the current eurozone regime, forcing perhaps even more austere budget-cutting in a country where the social safety net is already tattered. And those are just the problems inside Greece — though the Greek economy is just a fraction of the European economy, it could set off a chain reaction of fear, bank runs and deep recession throughout the eurozone as investors pull out of not only the peripheral economies, but also out of the entire eurozone. How would a massive Greek devaluation affect Cyprus? 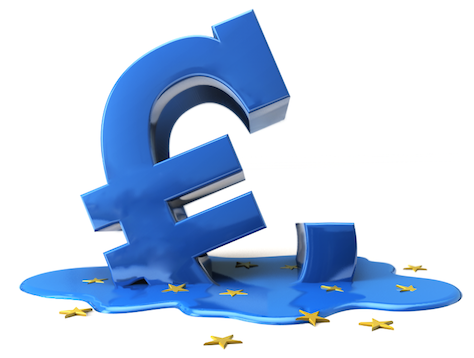 Would Spain and Italy withstand the inevitable bank runs and currency flight? The chain reaction of unraveling one of the world’s foremost reserve currencies could well be catastrophic. Klaus related the current monetary union to the breakup 20 years ago of Czechoslovakia into two separate nations — a process that Klaus said was painful though necessary (though the Slovak economy is doing much better these days than the Czech economy). But Greeks might be troubled by the more painful example of the breakup of the Yugoslav federation and the Soviet Union, both of which were also monetary unions as well as political unions. The breakup of the ‘ruble zone’ led to massive hyperinflation throughout the Soviet Union and an economic shock that cut standard of living in half. There’s simply no way to know what forces could be unleashed by the process — no matter what anyone says, there’s not a precedent for unraveling even a tiny part of the world’s largest currency union in an orderly fashion. I would have liked to hear, in particular, Klaus’s thoughts on another contemporary experiment in currency union: German reunification. With lightning speed (as far as coalition-building goes in the Netherlands), the two top finishers in the Sept. 12 Dutch election have formed a government that will seek €16 billion in budget cuts to bring the Dutch budget further into balance. 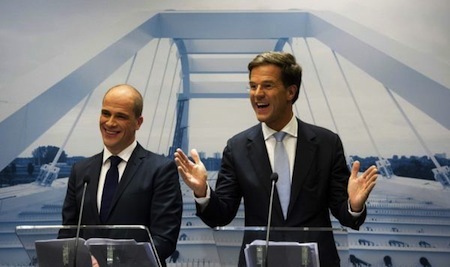 Standing in front of a futuristic poster of a bridge, prime minister Mark Rutte (pictured above, right), the leader of the center-right Volkspartij voor Vrijheid en Democratie (VVD, the People’s Party for Freedom and Democracy) and Diederik Samsom (pictured above, left), leader of the social democratic Partij van de Arbeid (PvdA, Labour Party) announced that they will form the next governing coalition together. The two parties finished first and second, respectively, in September’s election, far outpacing the other Dutch parties. Throughout much of the campaign, the more leftist Socialistische Partij (SP, the Socialist Party) led polls, only for Labour to emerge in the last two weeks of the campaign, as Socialist leader Emile Roemer seemed to stumble in various television debates and Samsom emerged as a credible alternative — more pro-Europe and less stridently leftist yet still more skeptical of budget cuts. Ultimately, the VVD won 41 seats and Labour won 38 seats — an increase for both parties. The Socialists won just 15 seats, a far cry from polls just two weeks prior to the election that showed them winning upwards of 3o or 35 seats. 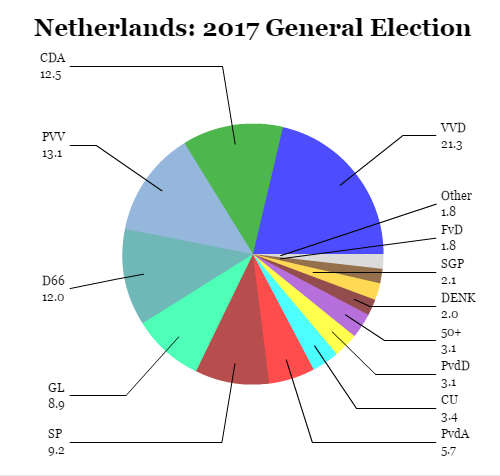 In switching from the Socialists to Labour, a huge chunk of Dutch voters have essentially moved the country from an outright anti-austerity coalition to a more stable, more centrist coalition — in fact, a return to the tradition of ‘purple cabinets’ of the past that included the VVD and Labour, most recently from 1994 to 2002 under various governments led by Labour prime minister Wim Kok. The reported terms of the coalition agreement make clear that, essentially, the Rutte II government will continue to pursue vigorous austerity measures designed to bring the Dutch budget within 3% of GDP, despite Samsom’s opposition to budget cuts earlier in the spring and his vigorous opposition to Rutte throughout the campaign. So in joining a government with Rutte, Samsom and Labour will leave the Socialists as the major anti-austerity opposition on the Dutch left. So how exactly will the Rutte II government differ from its predecessor? And what did Labour win in exchange for its support for a fairly pro-austerity agenda? It appears that Dutch coalitions may be even easier to form now that the monarch isn’t in charge of the negotiations. Both Dutch prime minister Mark Rutte of the free-market liberal Volkspartij voor Vrijheid en Democratie (VVD, the People’s Party for Freedom and Democracy) and Diederik Samsom, leader of the social democratic Partij van de Arbeid (PvdA, Labour Party) are moving forward with talks for a coalition government, despite clear divides on some of the most important policy issues that will face the next Dutch government. 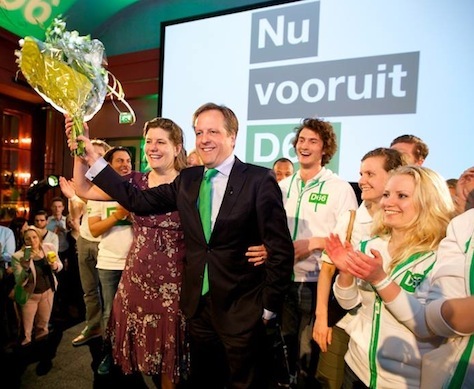 The VVD and Labour both emerged as winners by improving their existing standing in last Wednesday’s election — the VVD won 26.6% and 41 seats (an increase of 10 seats from the prior election in 2010) and Labour won 24.8% and 38 seats (an increase of eight) in the Tweede Kamer, the lower house of the Dutch parliament. The negotiations, for the first time, following a new 2010 law, will be organized by the Dutch parliment instead of by the monarch, reducing one of the key roles that the Dutch monarch has traditionally played in affairs of state. So instead of Queen Beatrix, VVD parliamentarian Henk Kamp has taken the lead in sorting which potential coalitions exist and now, as informateurs, Kamp and former Labour party leader Wouter Bos seem to have found enough common ground between Labour and the VVD for a potential coalition, and the camps are set to proceed with private negotiations out of the media spotlight. Typically, it takes around three months for a coalition government to be formed — notwithstanding the new cabinet formation process that excludes the monarchy, however, it seems likely that a coalition may now be formed within weeks. 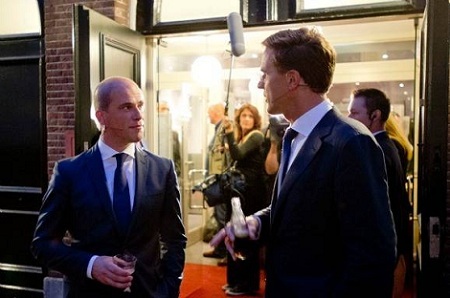 That’s because there are only a small number of viable coalitions, and because both Rutte (pictured above, right) and Samsom (pictured above, left) agree that forming a relatively stable coalition quickly is important, given the questions lingering over the 2013 Dutch budget and given the precarious state of European finances. After the 2010 election, the VVD formed a minority coalition with the Christen-Democratisch Appèl (CDA, Christian Democratic Appeal), with an agreement with the right-wing, populist, anti-Muslim Partij voor de Vrijheid (PVV, the Party for Freedom) to provide support for the VVD agenda from outside the government. That agreement held up only until April 2012, when the PVV balked at supporting further budget cuts to bring the 2013 budget deficit within 3% of GDP, thereby causing last week’s election — the fourth Dutch election in a decade. After preliminary inquiry into potential coalitions that began last Thursday, just hours after the election result, a so-called ‘purple coalition’ of the VVD and Labour emerged as the most likely coalition, so named because it would bring together the ‘blue’ VVD and ‘red’ Labour. The result would leave the two parties with a clear majority of 79 seats in the 150-seat chamber, but eight seats short of a majority in the upper house, the Eerste Kamer, where VVD holds 16 and Labour holds 14 of the 75 seats. Dutch prime minister Mark Rutte looked more likely than not to continue as prime minister of the Netherlands Tuesday night after his party, the free-market liberal Volkspartij voor Vrijheid en Democratie (VVD, the People’s Party for Freedom and Democracy) won the largest share of the vote in the Dutch election, with 98% of the votes counted. The VVD won 26.6% of the vote, entitling it to 41 seats in the Tweede Kamer, the lower house of the Dutch parliament, an increase of 10 seats over the 2010 election. It was followed very closely by the social democratic Partij van de Arbeid (PvdA, Labour Party), with 24.8%, which entitles it to 39 seats, a nine-seat increase from 2010 under the incredibly strong performance of Labour leader Diederik Samsom, a former Greenpeace activist who took over the party’s leadership only in March 2012 and spent much of the past year trailing the more staunchly leftist Socialistische Partij (SP, the Socialist Party) of Emile Roemer. All things being equal, Rutte and Samsom are the clear winners of the election. Rutte will now be able to attempt to form a government with a credible mandate for bringing the Dutch budget within 3% of Dutch GDP — his prior government fell in April of this year when Geert Wilders, the leader of the Partij voor de Vrijheid (PVV, the Party for Freedom), refused to support further budget cuts. Samsom is nearly as much a winner as Rutte, though. 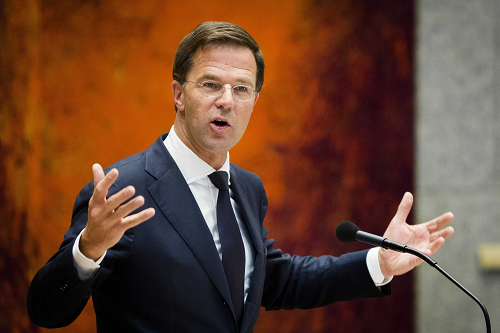 His polished performance in the various Dutch leaders debates (in contrast to Roemer’s often bumbling performances) convinced Dutch voters that he possesses sufficient poise to be prime minister. Samsom, a more leftist leader of the Labour Party as compared to his predecessor, former Amsterdam mayor Job Cohen, offered essentially the same anti-austerity option as Roemer, but without the anti-Europe sentiment of a Roemer-led government. Even if he remains in the opposition, he can become the chief voice against Rutte’s budget cuts during the next government and work to build upon his party’s gains from today’s election. The Socialists finished far behind with 9.7% and 15 seats — unchanged from 2010, but a huge disappointment after polls showed a gain of potentially 35 seats just a few weeks ago. 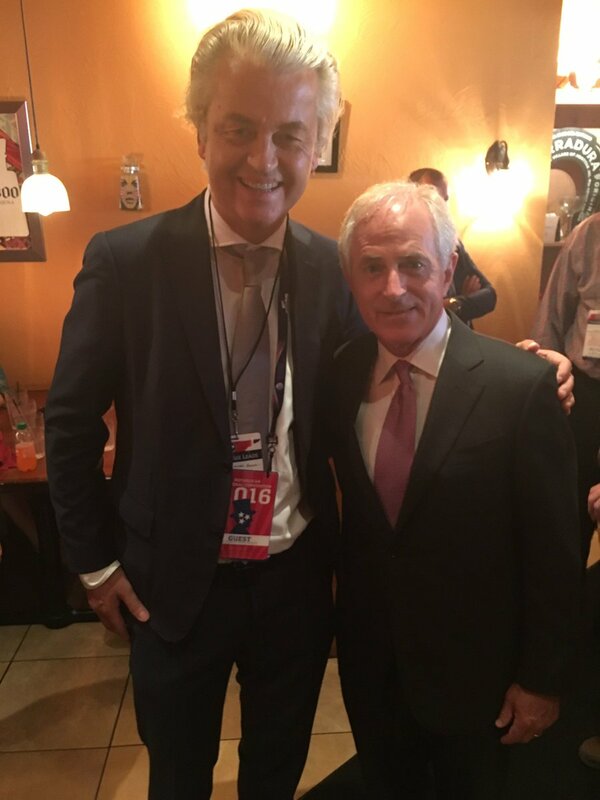 The Socialists, in fact, finished just behind Wilders’s anti-immigration, anti-Europe PVV — with 10.1% and also just 15 seats, it’s a nine-seat drop from the 2010 election, a huge disappointment for Wilders and a success for those who favor an approach of integrating Muslims into Dutch culture rather than excluding them. Essentially, voters seemed to blame Wilders for dragging them back to the polls just two years after the last election — and furthermore, the essentially pro-European Dutch did not seem to take to Wilders’s contrived and virulent campaign to bring the Dutch guilder back and pull the Netherlands out of the eurozone. 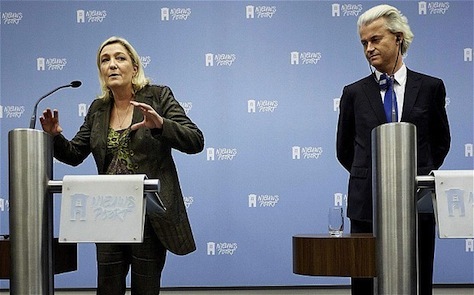 Wilders never found the same resonance over Europe in 2012 that he obvious found over Muslim immigration in 2010. Rutte’s coalition partners, the once-dominant but now-atrophied Christen-Democratisch Appèl (CDA, Christian Democratic Appeal) won just 8.5% and 13 seats, a drop of eight seats from 2010. The progressive / centrist Democraten 66 (Democrats 66) won 7.9% and 12 seats. 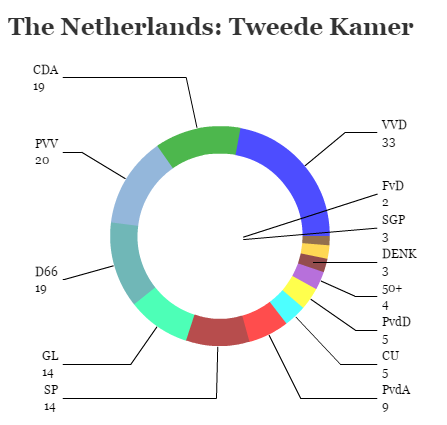 Also returning to the Tweede Kamer were the center-left, Christian Democratic ChristenUnie (CU, Christian Union) with 3.1% and five seats, the ecologist GroenLinks (GL, GreenLeft) with 2.3% and three seats, the Calvinist, ‘testimonial’ Staatkundig Gereformeerde Partij (SGP, the Reformed Political Party) with 2.1% and three seats, and finally, both of the newly-formed Labour spinoff 50PLUS and the animal welfare advocate Partij voor de Dieren (PvdD, Party for the Animals), each with 1.9% and two seats. As soon as tomorrow, cabinet formation talks are expected to begin — and for the first time, the Dutch parliament will take the lead in exploring potential coalitions (instead of the Dutch monarch, Queen Beatrix). Those talks typically take up to three months, but can take longer — the 2010 government was formed after four months of negotiations. In most countries, an election is the decisive moment in forming a government. After the election results are in, it’s usually immediately clear who will become the next president or prime minister or chancellor (or so on). Even in countries with complex parliamentary systems, where coalitions still take time to negotiate, it’s typically pretty clear to spot which party will emerge to form the government. In the Netherlands, however, the election is more prologue than main event: no single party has won a majority of seats in the Dutch parliament since 1900, so the main government-forming exercise is the complex negotiation that follows Dutch elections. While not as tortured as recent Belgian political negotiations, Dutch cabinet negotiations typically take around three months to complete — and that’s only when the coalition formation process is fairly routine. The last government, a minority coalition headed by Mark Rutte, was sworn in only in October 2010, following elections earlier in June. 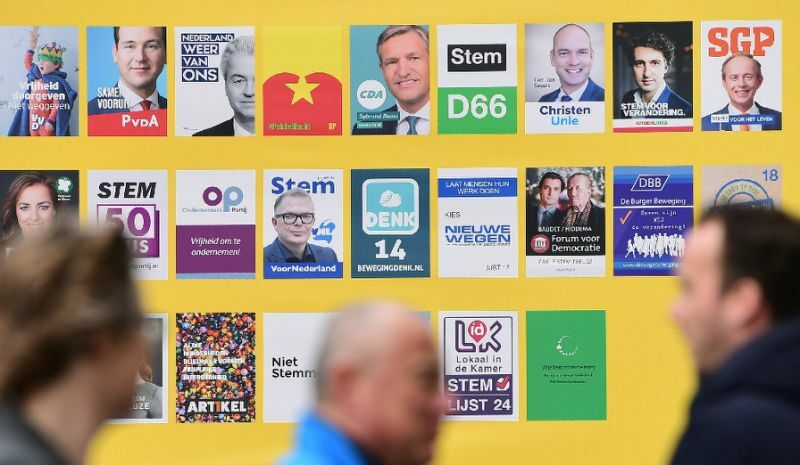 First, poll volatility and the likelihood that a large number of parties are expected to win double-digit numbers of seats in the 150-member Tweede Kamer, the lower house of the Dutch parliament, will make the arithmetic of forming a majority government even more difficult. 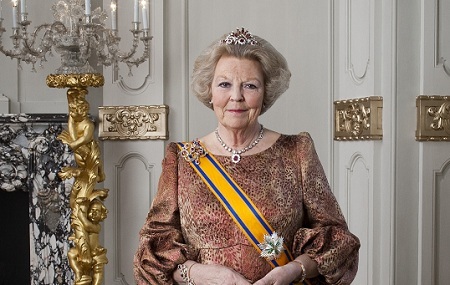 Second, MPs eliminated the role of the monarch from the cabinet formation process in 2010, which will now be headed by the chair of the Tweede Kamer, Gerdi Verbeet, instead of Queen Beatrix (pictured above), leaving the process more uncertain and less transparent than in years past. In years past, the Dutch monarch (since 1980, Queen Beatrix) has typically initiated the process by meeting with each of the party leaders and appointing an informateur, typically a senior statesman, to explore the possibility of various governing coalitions. Coalition negotiations can go through several stages of informateurs — for example, in 2010, the Queen ultimately appointed five different informateurs, including three who served in the role twice. Thereupon, the monarch appoints the formateur — typically the leader of the largest party in parliament — to negotiate the details of the coalition agreement among the coalition partners, including the governing agenda for the coalition, appointments to the cabinet and other issues. This year, the process is a bit more unsettled — it will be Verbeet and parliamentarians who can shape the agenda of the negotiations, which could result in delays as everyone navigates a new process, and which some critics believe could make the cabinet formation process less transparent. Although Queen Beatrix was widely seen as steering the 2010 negotiations away from any PVV participation in government (and that bias was one of the reasons MPs voted to strip the monarchy of its role in cabinet formation), it is not necessarily the case that parliamentarians will have any less bias in choosing informateurs. 35 seats for Rutte’s free-market liberal Volkspartij voor Vrijheid en Democratie (VVD, the People’s Party for Freedom and Democracy). 34 seats for the social democratic Partij van de Arbeid (PvdA, Labour Party), which has seen its support rise with the success of its leader Diederik Samsom in the recent debates. 21 seats for the anti-austerity, leftist Socialistische Partij (SP, the Socialist Party), a marked decline from a month ago, when it led polls, before its leader Emile Roemer made some anti-European comments and was seen as having stumbled in the debates. 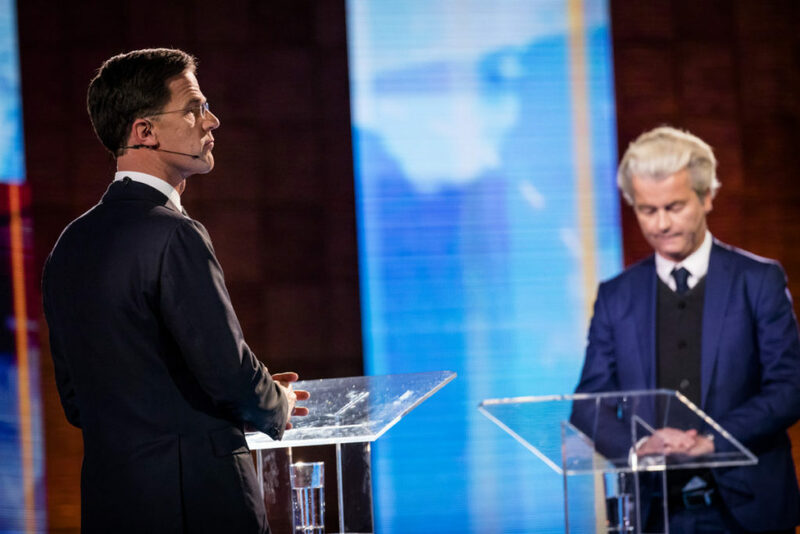 17 seats for the populist, anti-Europe, anti-immigrant Partij voor de Vrijheid (PVV, the Party for Freedom) of Geert Wilders, a sharp decline in seats. 13 seats for the progressive/centrist Democraten 66 (Democrats 66). 12 seats for the conservative Christen-Democratisch Appèl (CDA, Christian Democratic Appeal), a sharp decline. 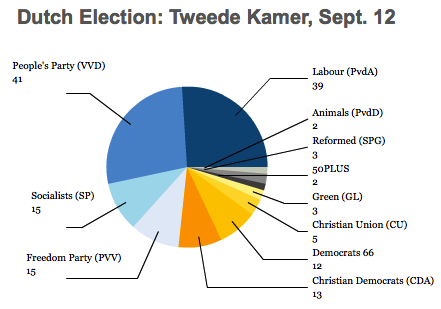 6 seats for ChristenUnie (CU, Christian Union), a smaller, vaguely center-left, Christian democratic party. 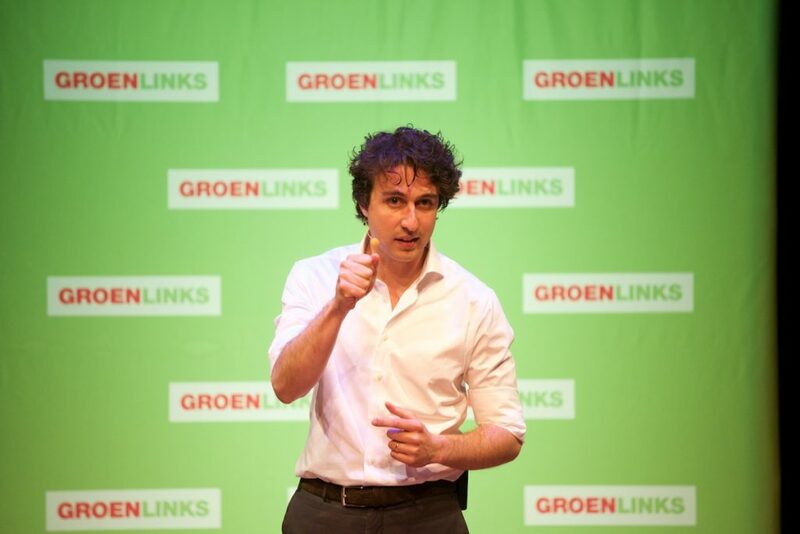 4 seats for GroenLinks (GL, GreenLeft), the Dutch green party. 4 seats for 50PLUS, a new party founded in 2009 by former Labour politicians. 2 seats for Staatkundig Gereformeerde Partij (SGP, the Reformed Political Party), a Calvinist party that’s in electoral alliance with ChristenUnie, but is typically a ‘testimonial’ party uninterested in joining coalitions. 2 seats for the Partij voor de Dieren (PvdD, Party for the Animals), another ‘testimonial’ party focused on animal rights and welfare. 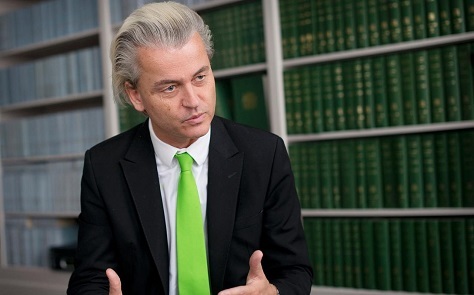 an unlikelier VVD-led pro-austerity coalition without Labour.